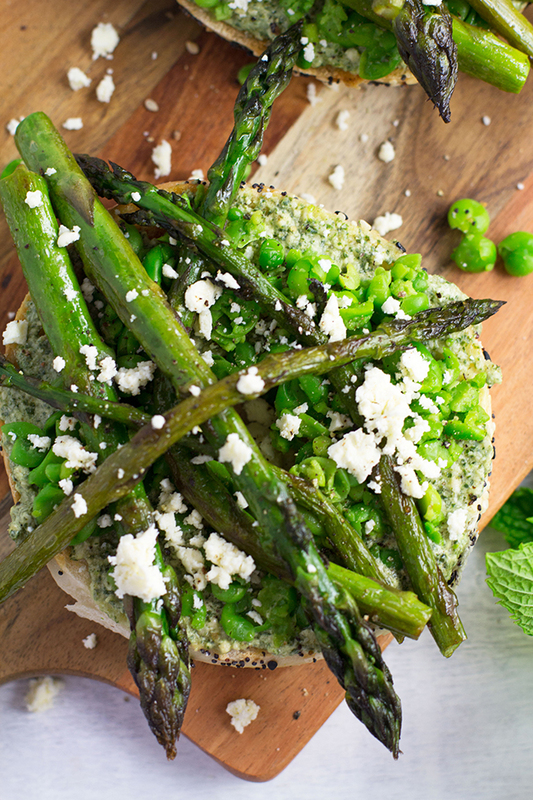 A toasted bagel with sautéed asparagus, smashed peas and a good slathering of my Mint and Feta Pesto. These bagels are packed with sooo much flavour and are guaranteed to become your new go to breakfast. Bagels, bagels, bagels….how you make my breakfast life filled with excitement. Regular bread can just not compare to your greatness. I love how great you are with a simple smothering of melty butter. Or slapped with a generous layer of cream cheese topped with new season tomatoes. And how you make the perfect bed for a good slathering of my MINT AND FETA PESTO. Do you guys remember the Mint and Feta Pesto that I posted last week?Have you tried it yet? I so hope you have, it is truly a spectacular sauce. 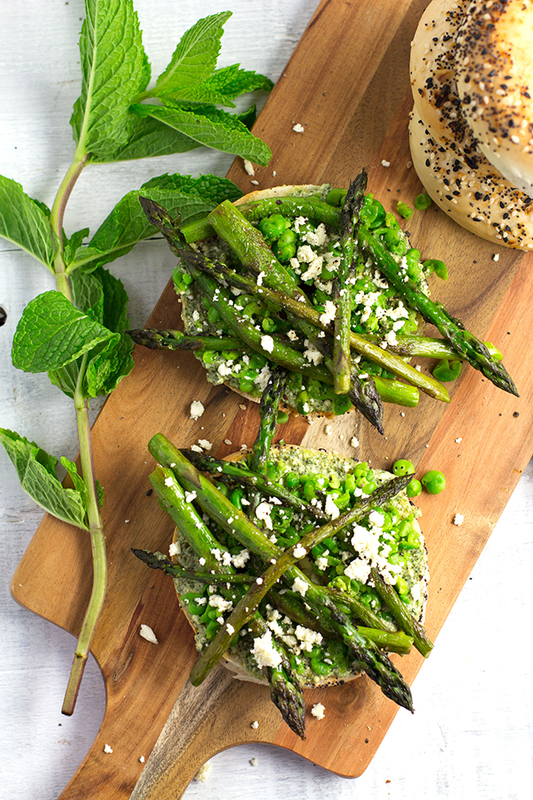 And if you haven’t then you are in luck, because today I share with you a fantastic way to enjoy it on these Smashed Pea and Asparagus Breakfast Bagels. We have just entered into the summer season down here in NZ. And if there is one thing that I love more than the longer days and extra sunshine that we are graced with at this time of the year, it would be the fabulous array of fruit and veg that come into season. Every Sunday Jase and I venture down to our local farmers market to stock up on our weekly veg stores. And I always get so excited when we go down and there is one more thing available to go into our basket. Lately we have had so many exciting options…eggplants, zucchinis, avocados, tomatoes….and asparagus. Which is a pretty special little veg. Did you know that it takes two-three years to grow from seed to harvest? That’s a pretty long time….and must be why it is so damn delicious. And to make them even more delicious than usual I have sautéed them in a knob of butter with just a little bit of salt and pepper. So simple but so effective on the taste. 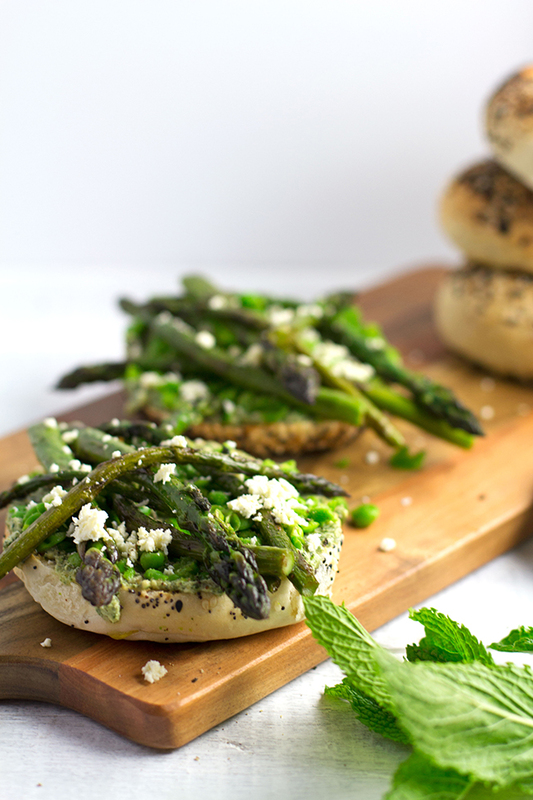 So cooking the asparagus is probably the hardest part of making these scrumptious breakfast bagels. The rest is all pretty simple. All you need to do is toast your bagel. I used an everything bagel for mine cause they are hands down my favourite type as far as the savoury bagel selection goes. But you guys can use what ever flavour you like. Boil up some frozen peas, drain them and smash them up. And whip up a batch of my MINT AND FETA PESTO if you don’t already have it on hand. Then you just construct your bagel. I like to crumble a bit of extra feta on top, just cause I can never get enough cheese in my life, but this is totally optional. I can absolutely see you guys falling in love with this bagel. It is easy to prepare and put together. It has a fantastic array of fresh flavours that just complement easy other perfectly. And it is filling enough without weighing you down for the day. Please let me know if you love it as much as I have, it would make my day!!. In a large frypan on a med-high heat add butter and wait till melted. Add asparagus spears and depending on thickness sauté for around 5-10 minutes. Season with salt and pepper. Whilst asparagus is sautéing toast bagels and prepare peas. Spread 2 tablespoons of pesto onto each bagel half. Evenly spread ¼ of a cup of smashed peas onto each bagel half. 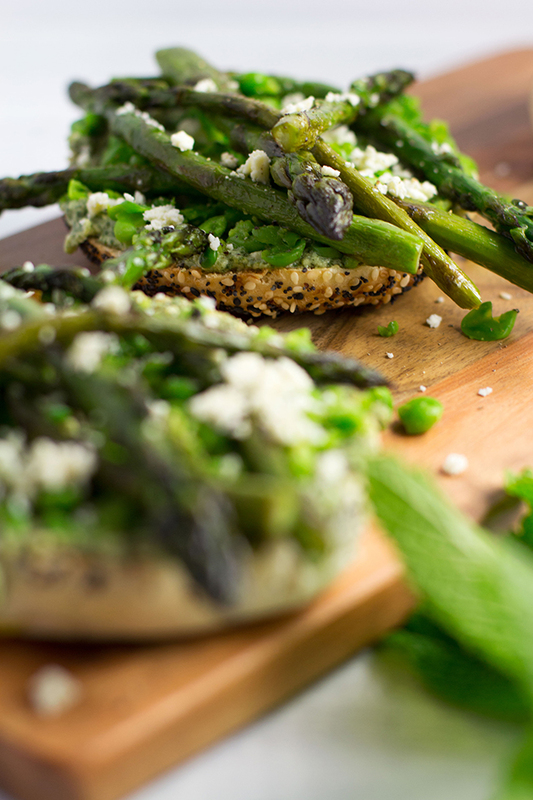 Once asparagus is cooked place 4-6 asparagus spears on top of bagel. Sprinkle on crumbled feta and a good crack of pepper.